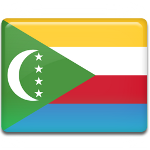 The Union of the Comoros celebrates its Independence Day on July 6. This public holiday celebrates the day, when the Comoros gained independence from France. The Union of the Comoros consists of four islands: Grande Comore, Mohéli, Anjouan and Mayotte. The island of Mohéli became French protectorate in 1886, when its sultan Mardjani Abdou Cheikh asked protection from France. The same year one of the sultans of Grande Comore, Said Ali of Bambao, asked French for protection in exchange for their support of his claim to the entire island. The four islands were unified in a single administration and placed under French protection in 1908. After abolishment of the protectorates in 1912, the islands became a province of the colony of Madagascar. In 1973 France and the Comoros agreed on gaining independence, that would come into effect in 1978. The referendums were held on all four islands. Majority of the population of three islands voted for independence, while inhabitants of Mayotte were against it. The Comoros gained independence from France on July 6, 1975. Since inhabitants of Mayotte were against independence, the island is still administered by France.